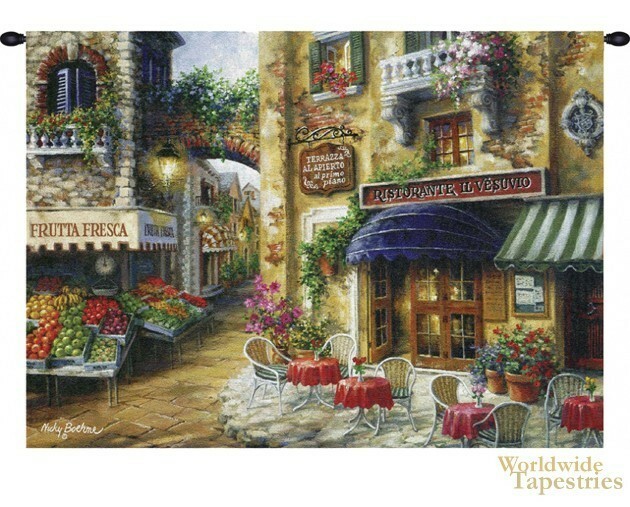 This Buon Appetito tapestry is based on the work of artist Nicky Boehme. Here we see a lavish scene of French country town lifestyle with Frutta Fresca of fruit shop, Terrazo al Apierto al primo piano or terrace on the first floor with piano and Ristorante il Vesuvo. The colors are delightful as is the composition willed with detail and lavishness of fruits and flowers adorning every ledge and balcony. From California, Boehme's works shows delightful composition and style. This Buon Appetito tapestry is backed with a lining and a tunnel for easy hanging. Note: tapestry rods and tassels, where pictured, are not included in the price.